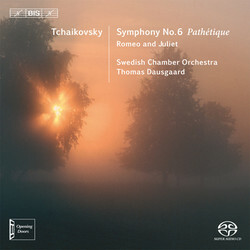 These two works from either end of Pyotr Tchaikovsky’s career are linked by their tragic endings – the Sixth Symphony with its concluding Adagio lamentoso descending into the deep and gloomy catacombs of a low string sound, and the ‘Fantasy Overture’ Romeo and Juliet closing with a funeral march. Both of them much-loved staples in the concert halls of the world, they appear here in ‘Opening Doors’ – the series conceived by Thomas Dausgaard and his Swedish Chamber Orchestra in order to provide the opportunity of hearing large-scale Romantic symphonic works in a new way, with the clarity that a chamber orchestra can offer. Begun in 2006, the Opening Doors project includes a full cycle of Schumann’s symphonies (‘the most perceptive Schumann cycle in over three decades’, International Record Review), Dvořák’s ‘New World Symphony’ (‘yet another orchestral gem’, klassik.com), and Symphony No. 2 by Bruckner (‘perfectly paced and balanced – and the small orchestra is all to the good in making Bruckner's stark originality clear’, BBC Music Magazine). These are now joined by Tchaikovsky’s last symphony – completed only a couple of months before the composer’s death in 1893 – a work which to many is the archetype of a true Romantic symphony.